Figuring that the kids have about one cathedral in them per trip, we chose the one in Burgos. It’s a good choice, a World Heritage site, with enough ornateness to last us pretty much the entire trip. And the fact that we again had audio guides helped the kids keep interest for much longer than is normally the case. L was bored a lot sooner than K, who actually likes beautiful places and looking at pictures of Jesus. She’s actually convinced she’d like to meet him, which has me questioning the secularness of our supposedly non-Christian school. After the cathedral, we looked around for a bit. But the only other things we might have found interesting (a couple of museums) were closed for siesta, so we decided to walk out to the shopping centre for groceries (after some fortification with chocolate con churros when we got to the mall, where K obsessed about this ride). We then continue our walk along the river back to the campsite, through a lovely park that seems to attract a lot of regular bikers and walkers. From what we saw, Burgos seems less liveable than Bilbao, with fewer and lesser playgrounds, but has made somewhat more progress towards having functioning bike lanes. Not that we saw a lot of cyclists, except mountain bikers going through the huge park between the city and the campground. In the morning, we packed up and checked out in the nick of time before hitting another must-do Burgos site on the way out – a monastery. It was also lovely, especially the elaborately carved marble tomb of early Spanish royalty. But I was quite amused at being asked if I’d liked it and then handed a card by a very urbane young monk (I assume) on the way out, asking me to give the place a five-star rating on Trip Advisor! 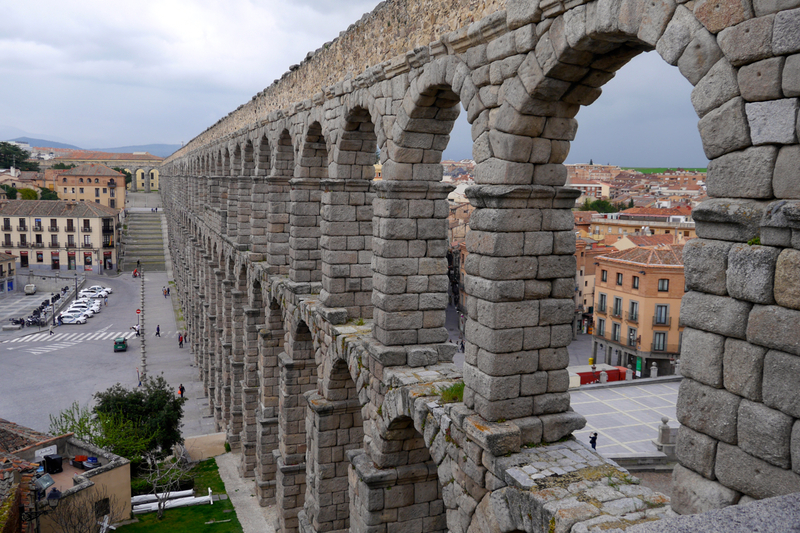 The Roman aquaduct in Segovia is another World Heritage site and it has a wonderful old town, so we headed there on our way to Madrid. As we approached the Sierras, it seemed like the rain in Spain actually falls mainly against the mountains, as there were clouds piled up against the range, dropping their water in an attempt to get over. As we approached the wall of mountains, we hit a few hard rainstorms but by the time we got to Segovia it was dry. It stayed dry as we saw the aquaduct and started to wander towards the castle at the other end of town, also supposedly a must-see. But by the time we reached the cathedral in the middle, there was a downpour, and with whiny, tired and wet kids, we sought out a café. Finally finding one that seemed to have chocolate con churros, we headed in, only to find they were out of churros. Never mind, we had hot chocolate and a bit of cake and waited out the rain before heading back to the van. We decided to do a drive-by of the castle, stopped for a quick picture and headed to Madrid. The fastest non-toll route turned out to be over a winding mountain pass, with lots of switch backs, topped by snow and a ski resort. As we came down the other side, we were glad to see that none of the clouds had made it over with rain in them, and it looked dry. We got to our campsite, had some eggs, beans, bread and veggie sausages we’d picked up in Burgos, and headed to sleep, ready for our trip into Madrid in the morning. Ik vind het heel leuk om foto’s van jullie te zien. Zeker van Liam en Kaya. Zo leuk!!!!! Zijn jullie ook van plan om naar Spanje te gaan? Dan kunnen we elkaar misschien ontmoeten? Kus voor iedereen.